I’ve completed my third Footy – a Pool Shark 3D, designed and sold in kit form by Chris Staiger. Chris won the 2010 Footy Nationals with this boat. She’s what’s called a “double diagonal” in that the boat needs to be tilted bow up and rotated to point bow and stern at the corners of the measurement box in order to fit, but fit it does. A 15” boat in a 12” box. The hull is vacuum formed styrene plastic. The una-rig sail is tall, with a severely raked boom to swing clear in (above) the measurement box as the rules require. The red and white boat in the video at the end of my Kittiwake K2 build log is a Pool Shark 3D built by my friend Ted. I’m not doing a build log on this one for a simple reason: Chris provides an instructional DVD that shows you everything you need to know to build one. I’ve named her Tiger Shark and she’s become my favorite boat. The shark eye and mouth decals (think Flying Tigers) are from military-graphics. The custom vinyl transfer boat name is from my pal Del at G-Scale Graphics. Here are some photos. Here’s a link to Carl Hansen’s excellent instructions for Mylar Sail Numbers. In the “easy to sail” category, Tiger Shark falls somewhere between my Kittiwake K2 (easiest) and my Razor 3 (more touchy). Which is fastest? Probably Tiger Shark, but I really should do several iterations on the Internet Course, pitting Stepin’ Razor against her, to make that determination. 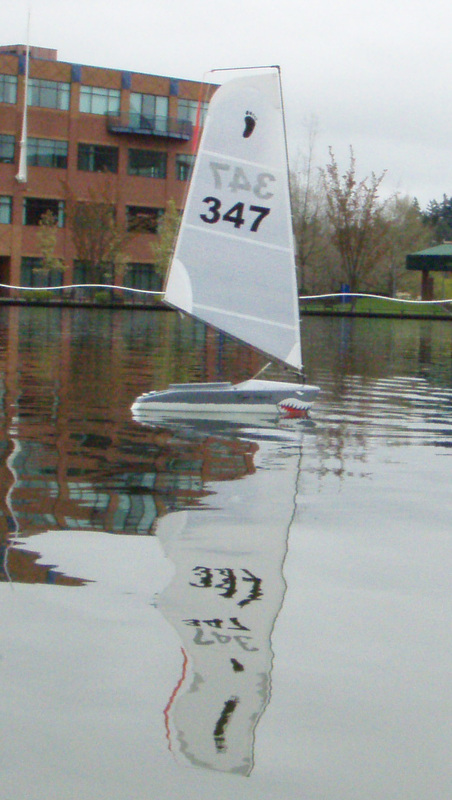 One fun thing about the Pool Shark 3d is that four members of the Rose City Model Sailing Club own one, making for spirited “one-design” racing. Build one and join our fleet! This is really pretty easy and I love the result! At the top of this page, there’s a link to Carl’s excellent instructions. Silvery on the backside, Black (or color of your choice) on front. Put paper print under sail to serve as layout. Peel top half parchment backing, place # then peel bottom backing. Cut out numbers with an Xacto knife.Make interior cuts (eg: the center of the “4”) first, then exterior. Bring the paper number on top of Mylar tape (hold up to light to make sure of coverage) and Scotch tape all around. Cover the numbers by sticking Mylar tape to the parchment, overlapping tape 1/8” . Cover with a piece of parchment paper folded in a “Z”. Carl Hansen’s method for Mylar sail numbers. 1st: Print numbers in Arial Black font, 200 pt. Hobby King transmitter and receiver – my first excursion into low cost 2.4GHz systems. 4-AAA battery box with switch can be used with 3-AAA lithiums plus a shunt. Receiver velcroed to underside of hatch cover (up away from any water intrusion). For the masking between gray and white I used “paper tear” scissors to cut the tape. The shark mouth & eye decal from military-graphics. Boat name lettering from G-Scale Graphics.